The research, detailed Monday in the journal Proceedings of the National Academy of Sciences, lays bare how even seemingly small increases in average temperatures can make a big difference to the extreme weather that people experience. 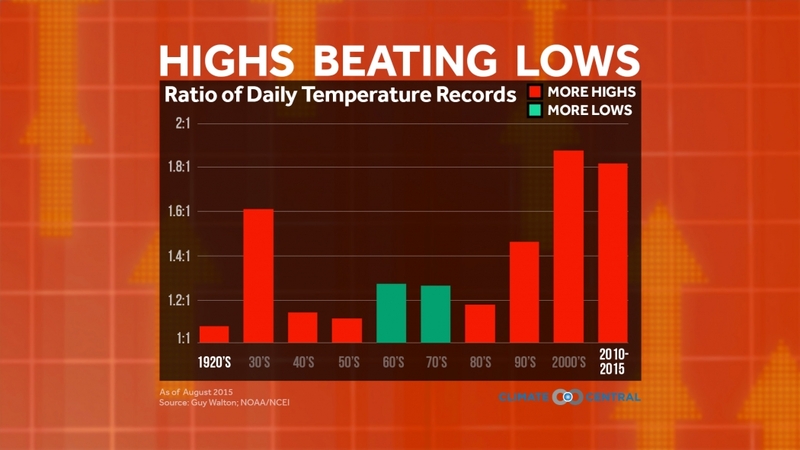 “You can actually see it through these record highs and lows. And we’re already seeing it,” study co-author Gerald Meehl, a senior scientist at the National Center for Atmospheric Research in Boulder, Colo., said. Extreme heat poses significant risks to human health, particularly to vulnerable populations like the elderly. It can also damage agriculture and push rain-starved areas into drought. In a world without human-caused warming, record lows would be expected to occur roughly as often as record highs over the long run, even if the ratio varies from year-to-year. But as Earth’s baseline temperature continues to rise, it increasingly shifts the odds in favor of record heat and away from record cold. In particular, overnight lows have been hitting record high levels. They noticed, however, that climate models were overestimating the ratio slightly compared to observed temperatures. In the new study, they dug into why that might be, and found that models tended to underestimate precipitation and resulting evaporation, which tends to have a cooling effect. Meehl and co-authors Claudia Tebaldi, also of NCAR, and Dennis Adams-Smith, who was a Climate Central data analyst during the study, wanted to find a more straightforward way to estimate the future increase in the high-to-low ratio. To do that, they established the relationship between that ratio and the increase in average temperature over the contiguous U.S. (versus linking it to a particular emissions scenario) and extrapolated it out into the future. They found that if the average U.S. temperature rises by 3˚C (5.4˚F) above the 1930-1949 average, the ratio of record highs to record lows will expand to 15-to-1. A 4˚C (7.2˚F) rise in average temperature will balloon the ratio to 38-to-1. 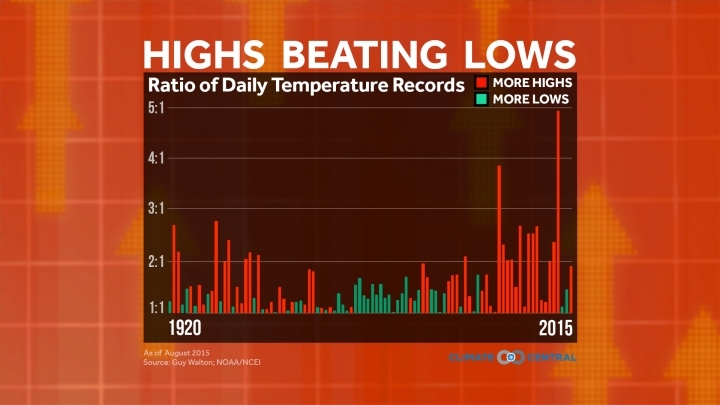 While a rise in average temperatures seems abstract, such a shift in extreme heat compared to extreme cold is “something people can at least get their head around,” Meehl said. If emissions continue on their current path, that 3˚C rise could occur by 2065; significant cuts in emissions would delay that point, while accelerated emissions would make it come sooner. Even with a major shift toward extreme heat, cold records will still occasionally be set, because, as Meehl said, winter will still happen. They will just become fewer and further between.